Ancient Stones - Lothian - 040 Stones, Kipps Farm, Torphichen. 040 Stones, Kipps Farm, Torphichen. Said to be the remains of a Druid's Temple where sacrifices were made in ancient times, being composed of 5 large stones suggestive of a cromlech and with numerous other stones around the base. 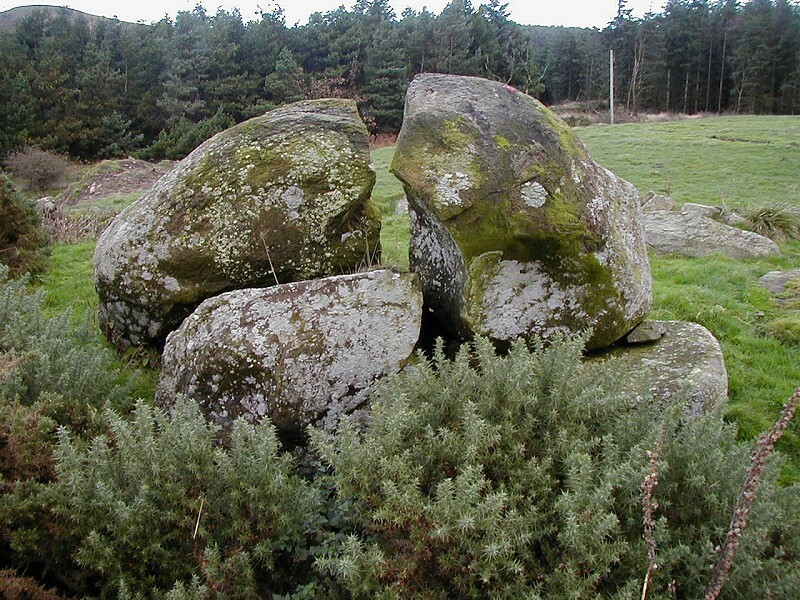 While this romantic image would be preferable, in reality, the stones are probably just natural erratics or were placed there during field clearance but it would be nice if archaeological investigation would prove otherwise! Kipps Farm can be found to the west of the road between Linlithgow and Bathgate, opposite Beecraigs Country Park. Ask at the farm for permission to park. A local to the area that I met at Cairnpapple mentioned that courting couples who reach through the gap between the stones, may be granted good luck. However, this has not been substantiated and I wonder of they were having "that strange guy" on a bit. I had spotted this jumble of stones on an earlier visit but was not sure if it was genuine or not as it looks suspiciously like a pile of boulders dumped from field clearance. The RCAHMS state the stones are natural, probably glacial erratics. Various writers have claimed the structure to be the remains of a Druids Temple, a stone circle, and a cromlech. I wonder? 036 Cairn, Cairnpapple Hill, Torphichen.